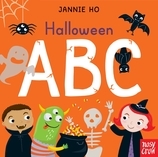 This sturdy alphabet board book introduces simple seasonal words to get toddlers excited about Halloween. Along with letters to say out loud, there are bright pictures featuring lots of happy faces and familiar spooky details to spot. 26 / 6 11/16" x 6 11/16"
Jannie Ho was born in Hong Kong and raised in Philadelphia. She studied at Parsons the New School for Design in New York. After working as a graphic designer and an art director at Nickelodeon, Scholastic, and TIME For Kids, she decided that illustration was her true calling. She lives with her husband and daughter in Boston.